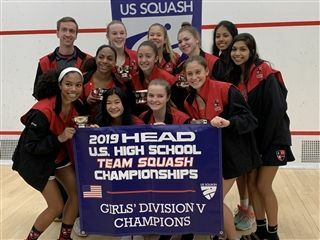 The Kingswood Oxford varsity girls squash team captured the Division V title at the 2019 U.S. High School Team Squash Championships on Sunday. The Wyverns defeated Nardin Academy, Squash Smarts Varsity, Moses Brown School and Buffalo Seminary to win the title at the prestigious event. Ananya Alleyne '19, Izzy Berckemeyer '21, Amelia Levine '20, and Ely Alleyne '23 dispelled all doubts by dominating the center of the court and pulling off 3-0 wins for the team. Cami Berckemeyer '19 showcased her adaptability and fluid strategy with a 3-1 win in the number three spot. "I think our team's key to success this weekend was staying consistently focused so the quality of their shots could also stay consistent," coach Biondi said. "While the other teams had their good games and their bad games, we had streaks of solid games that forced our opponents to really pull off something spectacular to get a win off of us."